We changed her name to Gracie and updated her chip information accordingly. She’s a wonderful addition to our family and is adjusting well to busy life with 5 kids to play with. We took her to our vet (Lakeland) in Perham for an initial wellness check and a grooming at Best Pets in DL and she is doing great! Her appetite has returned and on the advice of our vet, we are free feeding her until mid-November. She is scheduled for a follow up wellness check and yearly immunizations in February. Gracie is enrolled in basic training courses starting next week in DL to help us learn how to make Gracie’s transition more fulfilling, but she is a sweetheart. 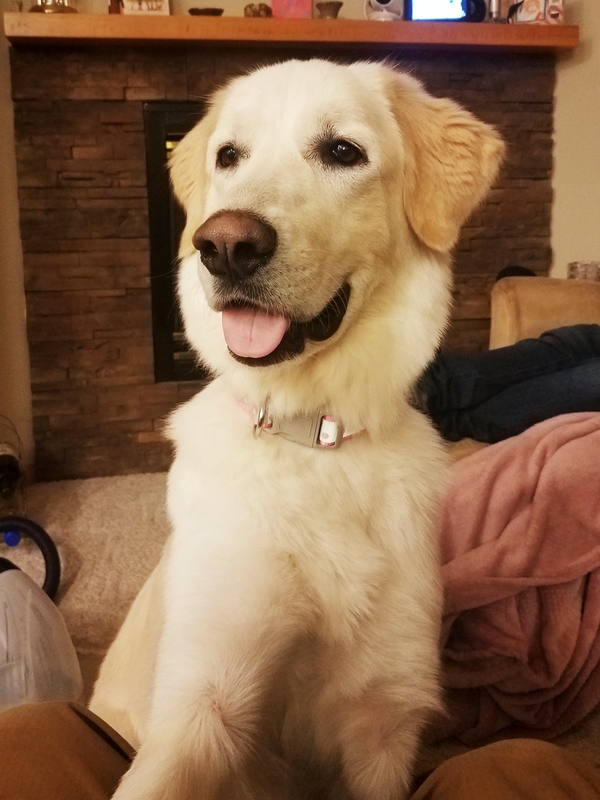 She loves to play, which is daunting for the little ones, but she is lovable and enjoys her daily walks and trips to the dog park. She gets along great with other dogs and has shown no signs of aggression towards other people or animals. She’s so well behaved on walks that our older kids have no trouble taking her on long outings unsupervised. She is also pretty adept on family hikes at the local state parks. We couldn’t feel more blessed to welcome Gracie into our home.